Do you feel like you are approaching parenting “the right way” but still feel frustrated or like something is missing? Is it your tendency (like mine) to focus on what God is doing in your children through your parenting and fail to recognize that God wants to parent you through your parenting of your children? 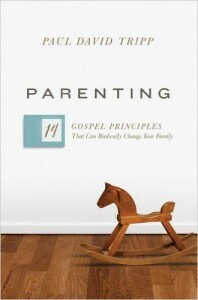 If you answer “yes,” then Paul Tripp’s book Parenting: The 14 Gospel Principles That Can Radically Change Your Family would be an excellent resource for you (as it was for me. To help you get to know a book that helps you learn the “why” of parenting that fuels the “how to,” I have included a PDF sample of chapter 2 (see below). This chapter makes eight points about grace that are tailored in their application to parenting. Like everything else God calls people to do, God doesn’t call people to be parents because they are able. God never calls us to a task without giving us what we need to do it. God’s grace frees you from having to deny your weakness. God’s grace rescues you from you. God’s grace works to make your heart tender. God’s grace liberates you from the prison of regret. This was a refreshing read for me. I love the practical books, so it took me a while to adjust to parenting book that didn’t give me collection of new techniques. But the more I read, the more I realized that having a deeper gospel perspective on why God chose to use in-process parents to raise in-process children it gave me more patience and skill with the techniques I already knew. I hope that you find the same. To download a PDF of chapter 2 of Paul Tripp’s book click here. Taken from Parenting: The 14 Gospel Principles That Can Radically Change Your Family by Paul David Tripp, ©2016, pp. 33-44. Used by permission of Crossway, a publishing ministry of Good News Publishers, Wheaton, IL 60187, www.crossway.org.